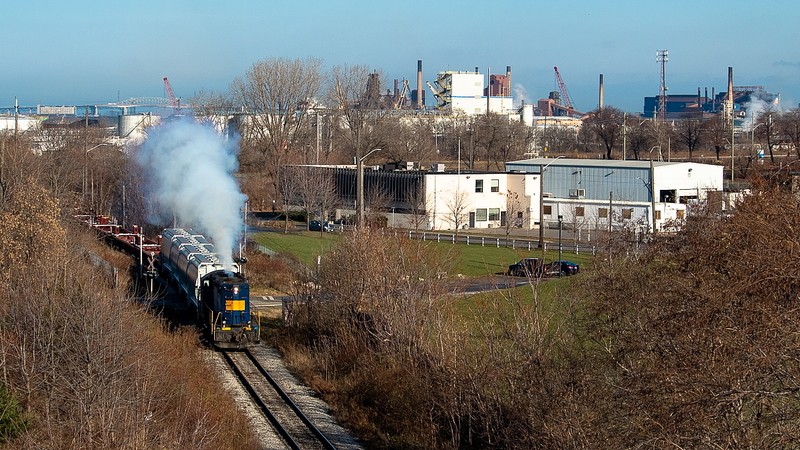 Railpictures.ca - James Knott Photo: The sun had just came out about five or ten minutes earlier, presenting me with the opportunity to get a shot of a smoky 4003 heading out of the hole with some hoppers and well cars from NSC. The smoke only got heavier as they approached Ferguson Ave, leaving one motorist rather perplexed as to what they had just driven into. With not much in the way of a breeze today, it hung in the air long after the train was back in Stuart. | Railpictures.ca – Canadian Railway Photography – photographie ferroviaire Canadienne. Caption: The sun had just came out about five or ten minutes earlier, presenting me with the opportunity to get a shot of a smoky 4003 heading out of the hole with some hoppers and well cars from NSC. The smoke only got heavier as they approached Ferguson Ave, leaving one motorist rather perplexed as to what they had just driven into. With not much in the way of a breeze today, it hung in the air long after the train was back in Stuart. @Steve.. I’m trying to exercise more patience with I submit! You’re right, lots of years ahead yet. This is well done The smoke just makes it. Yes.. that’s where they are headed in this photo. Is SOR still running into Stuart for interchange?